Let’s see what is catmint and how you can use it to please your cats. In nature, cats love to eat vegetables, or rather the herbs that are available, also in the fields. It’s a physiological need that often domestic cats (especially our feline friends staying indoors and never going out) fail to satisfy. It being understood that in every house where there comes a pet, should be eliminated all the potentially dangerous plants (many of the common apartment ones are toxic to dogs and cats when ingested). It may be good then, to grow at home some healthy catnip. It’s demonstrated how this plant has a particularly beneficial effect on many cats, but also on other big cats (like lynx, leopards, jaguars, etc.). Have you ever asked about how tigers, lions or leopards react to catnip? The scientific name is “Nepeta cataria” and is a perennial plant native of Europe and Asia. It grows very easily outdoor, so much that it is often considered weeds, especially in the U.S. and Canada where it is widespread. Its active ingredient is the Nepetalactone (in the leaves and the stems) that if inhaled (maybe when the cat sniffs the grass) causes curious and unusual changes in your pet’s behavior. With this regard, have fun watching this video of a cat going crazy for catmint! From the biochemical point of view, catnip seems to have correlations with marijuana, but it is certainly not dangerous for the pet. The effects of this plant, however, is not detected in all cats. Around 10-30% of our feline friends do not react to catmint, regardless of age. They speak of a genetic predisposition, the “catnip gene”. According to studies, the cats who respond to this plant are particularly sensitive to the smell of nepetalactone and would eat or sniff catswort, touching it with their legs to make further disperse of the aroma. Why Should You Give Catmint to Your Feline Friend? Simply because your cat becomes happy! It can be used as a reward during training (perhaps to accustom the cat to scratch in a specific place or when you teach him to sleep in his place). It can be a good way to encourage your cat to do some exercise or can help him relax. When cats come in touch with catnip they may also behave like heat season: rubbing their heads and body on the plant, jumping, rolling around, vocalizing and salivating. These effects last for about 5-15 minutes, after which our feline friend becomes temporarily immune to catmint for around 30 minutes. Some ethologists and other scientists believe that this substance stimuli just the parts of the brain related to the sexual sphere, instead of another pleasure center. Catmint is sold in pet stores and even supermarkets (here’s the link to Amazon), under various formulations: plant seeds, bulbs, potted plant already grown, dried form, spray or essential oil. Catnip can be used as a prize in the educational phase of your cat, or as relaxing. Sometimes it has an aggressive effect (especially on uncastrated male cats), so you should avoid it at the first signs. In most cases, however, this plant (also called cat’s heal all) is used for domestic cats to facilitate the escape of the bolus they accumulate with daily cleaning of the hair (I personally don’t have this issue, as I brush my cat every morning). There are many types of this plant, although the real one is just the Nepeta cataria. Finally, consider it as nonaddictive and completely harmless to cats. 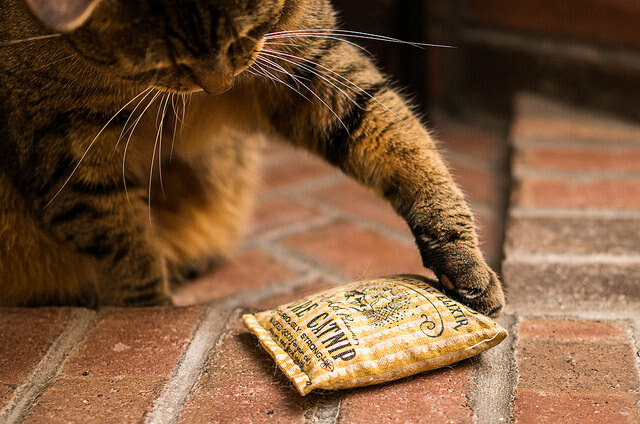 My cat goes insane for this stuff…so much so I was wondering if it was truly okay for her! I bought the plant for my bee’s but the ‘local’ cat in the area is loving it and it’s all squashed. Will the plant re grow. Or what’s available to stop the cat getting to the plant. I have just cut back a plant I have in the garden and Mr Boots, who is nearly 16 was having a great time. Only ever seen the “visitors” or “randoms” as I call them, play in it. I raised a catnip plant in a community gardern and protected it with a chicken wire cage. On a late summer afternoon, I went to water the garden and the cage had been thrown about 3 feet from the plant. There was a big ginger cat who had eaten the entire plant, leaves branches etc. and the plant was down to a 3 inch nub. I don’t know how long she had been there but there was evidence in the dirt that she had been rolling in it and it was completely flattened all around the plant. I wanted to pet her but her eyes were all wild and I thought better of it. I let her linger in her ecstacy. Warning – don’t count on your plant being there when you are ready to harvest it.